David and Lana Mounts created the Mounts brand in 2005 with the help of David’s parents. It was a dream come to true to follow Mounts grapes into a bottle of wine of their own making. The 2005 vintage produced 500 cases of wine distributed over four wines; Syrah, Cabernet Franc, Cabernet Sauvignon, and Petite Sirah. Over time, production increased and several more varieties were added to the portfolio. 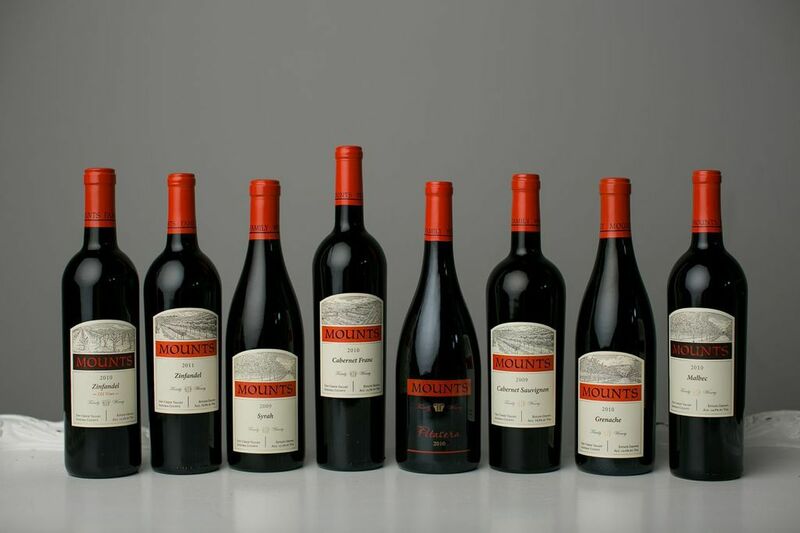 To date, the Mounts label is home to mainly single varietals; Viognier, Grenache, Old Vine Zinfandel, Malbec, Syrah, Cabernet Franc, Cabernet Sauvignon, and Petite Sirah. The Mounts brand represents tradition, commitment, stability, and most importantly strong family values that will continue on to future generations. David and Lana Mounts have had a long love affair with Rhône varieties. This “Rhône Romance” began while they were dating in the late 90’s. Every chance they had, they made weekend trips to Paso Robles and wine areas along the Central Coast of California. This is where they discovered Rhône style white wines such as Roussanne, Viognier, and Grenache Blanc as well as Rhône style red wines and blends like GSM (Grenache, Syrah, and Mourvèdre). They were eager to learn more about these grapes and the wines made from them. The time and research they gave to their Rhône project eventually paid off and the same year Mounts Family Winery was established, they planted their first acre of Grenache. Over the last decade they have continued their exploration of Rhône varietals, finding the most suitable pockets on their estate to plant these grapes. Presently, they have 14 Rhône varieties planted on the Mounts property; Viognier, Roussanne, Grenache Blanc, Picpoul Blanc, Clairette Blanc, Bourboulenc, Vaccarese, Grenache Noir, Syrah, Mourvèdre, Counoise, Cinsault, Terret Noir, Carignane. With so many Rhône varieties planted and producing amazing fruit, David and Lana wanted to give the unique wine and blends they were creating a proper home. In 2012 Verah was created and the first wine born into that brand was the 2012 Verah, Rhône Style Red Blend (Syrah, Grenache, Mourvèdre). Thereafter came Verah, Rhône Style White Blend (Roussanne, Viognier, Grenache Blanc, Picpoul Blanc), Verah Picpoul Blanc, and Verah Pink Wine, Rhône Style Rosé. Verah (roll the r), was the name of Lana’s maternal Russian grandmother and coincidentally David’s maternal Italian grandmother. Verah means Faith in Russian and is also the middle name of David and Lana’s daughter Emily. Emily is the artist behind the Verah flowers. She began drawing these flowers at the age of 9 and over the years she has gifted us with many beautiful drawings to adorn future Verah labels.